Here is a remarkable house with huge overhang over a hill side in Herisau, Appenzell, Switzerland. 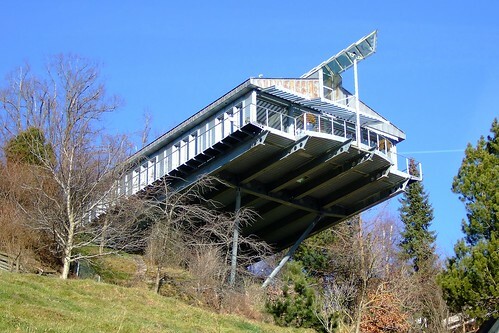 Designed by architect Reinhard Waldburger, who deliberately designed the house to look like a drawer emerging from the hillside. The glass and steel house juts over the slope by about 20 metres and its base of six long I-beams is supported by two massive steel supports. Although the land has a differential elevation of about 13 metres, the entire living space is at a single level. Entire house, except for a bedroom at the rear, is in the air with the living room at the extreme end, which in words of the owner "sways slightly in high winds." However the spacious living room offers a breathtaking panorama of the Alpstein mountains.